China Southern Airlines probably isn’t a household name outside of China – certainly not outside Asia. Yet this is an airline with ambition – it’s grown substantially - becoming China’s biggest airline and one of the top ten biggest in the world. The airline offers the most comprehensive route network in China, one of the most comprehensive route networks in Asia and an increasing number of regional routes – that includes Europe, the Middle East and North America – mostly from its hubs in Guangzhou (an hour from Hong Kong) and Beijing. The airline offers cheap tickets on many routes, often substantially cheaper than its competitors. Where Does the Airline Fly? Based in Guangzhou, Southern China Airlines is a powerhouse in the Chinese aviation industry and has the country’s most developed network of routes. The airline’s hubs are Guangzhou Airport and Beijing Airport, with additional mini hubs in Dalian, Shenyang, Urumqi, Zhengzhou, Changchun, and Shenzhen. From these locations, the airline connects to dozens of Chinese destinations, including smaller towns. Regional destinations include almost all Asian capitals, including Singapore, Hanoi, Bangkok, and Tokyo, as well as dozens of smaller cities. China Southern Airlines has one of the most developed route networks in Asia, although most routing is through Guangzhou and Beijing. In recent years, Southern China Airlines has aggressively expanded their international operation and become China’s largest airline. The airline flies to Paris, Amsterdam and Los Angeles as well as a host of Middle Eastern and North Asian destinations, such as Tehran, Tblisi, and Khatmandhu. Frankly, the website is a mess and doesn’t inspire much confidence in the booking procedure. For those who do manage to navigate through the booking maze, the reward is cheap tickets and we haven’t heard any reports of hiccups with tickets once the purchase has been completed. The English language website hasn’t been online long and the translations are at best clumsy at worst nonsensical. If the website puts you off, almost all travel agents in China sell China Southern Airlines tickets as do an increasing number of international travel agents. You can also buy China Southern tickets through travel booking portal Zuji.com, often at a substantial discount and with the security of booking through an established agent. There’s a real mixed bag of planes flying the Southern China Airlines flag, with an ageing fleet being replaced – slowly – by newer planes. By and large, planes are older Boeing and Airbus planes and seating can be squeezed in economy. In-flight entertainment is also hit and miss with a number of long haul flights having no in-flight entertainment in-seat and others having older systems with very limited options. 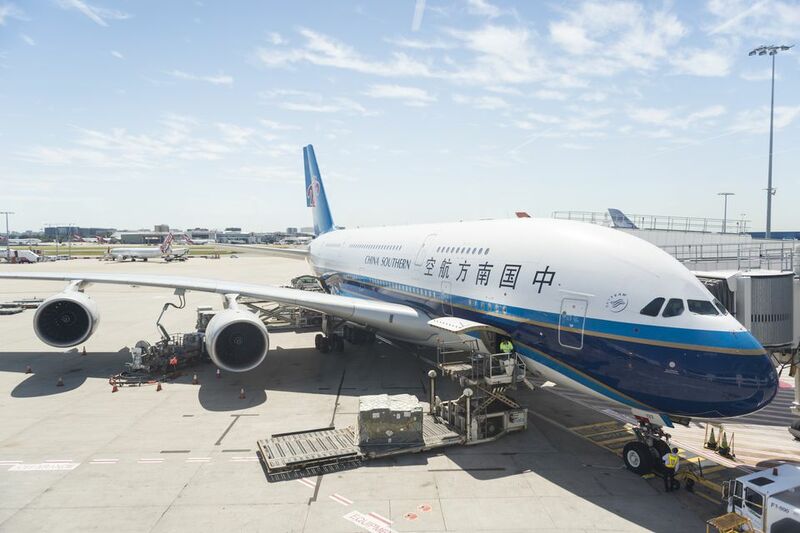 Apart from that, while other airlines squeeze travelers for extra costs, China Southern Airlines offers the economy traveler free checked in baggage and decent sized if uninspired in-flight meals. Chinese and sometimes slightly wacky Western options are a standard on long-haul flights – spaghetti in chicken sauce anyone? You’ll get more room – a woolen blanket and a bottle of water – in Premium Economy. Further classes include business and luxury first class and offer more rewards. These include standards like laptop charging points and ergonomically designed tilt seats as well as more unique touches like an onboard teahouse – on select flights. In all honesty, facilities for all of these classes are a little disappointing when compared to competitors, although you will likely be paying substantially less. This, like many things in China, very much depends on where you are flying to and from. Fly internationally or on major domestic routes, such as Guangzhou to Beijing and you should find staff with decent to good English language skills. While the vast majority of flight attendants are Chinese and Mandarin is their first language, the airline's international expansion has seen it take on more international staff; including French, Korean and Australian flight attendants. Off the international routes and on smaller regional or domestic routes, English service will be seriously limited - although even here the airline is striving to have at least one English-speaking flight attendant – they aren’t there yet. Many people unfamiliar with Chinese airlines are nervous about traveling with China Southern Airlines. While China has had some issues with airline safety in the past, standards have been raised substantially and safety meets international standards. China Southern Airlines has been involved in a handful of accidents, the last major incident being a crash in 1997, but its safety record is comparable with other international airlines. There have been complaints about the training and English language ability of pilots, including misunderstanding instructions from air traffic control and ground crew. China Southern Airlines has partnered with US partners to raise the quality of staff training and aircraft maintenance. China Southern Airlines has one of the most developed route networks in the world and their coverage of China and Asia, as well as less traveled destinations in the Middle East and North Asia, is superb. Their growing European and North American flight network also offers a chance to reach China for cheap. Almost all Southern China Airline flights are routed through Guangzhou and Beijing and there are very few point to point flight but if you can stand the transfer, this can be a good way to get a cheap flight to your destination in Asia. Service and amenities are not up to the standards of other international flag carriers, particularly on seating and in-flight entertainment, which can be a problem on long haul flights. Things are improving and if you are more concerned about getting to your destination cheaply, choose China Southern Airlines.